Two traditions, one not-so-new and one new, in one city. Quincy, Massachusetts, is a city steeped in historical tradition, being the home to two presidents. Dunkin’ Donuts coffee has been part of many Quincy folks’ morning routine for 68 years now and Coffee with a Cop Day was first held in Hawthorne, California, in 2011. Quincy police officers celebrated their third annual 2018 Coffee with a Cop Day at a Dunkin’ Donuts in the heart of the city, across from City Hall in the President’s Place area of town. The first Dunkin’ Donuts restaurant was opened in Quincy in 1950. 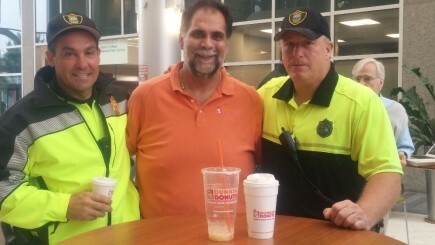 Lt. Robert Bina, Dunkin’ Donuts franchisee Victor Carvalho and patrol officer James Silcox at President’s Place in Quincy, Massachusetts. The original location, located a short distance from the President's Place Dunkin' site, was retro-designed in 2011 to match the original building. 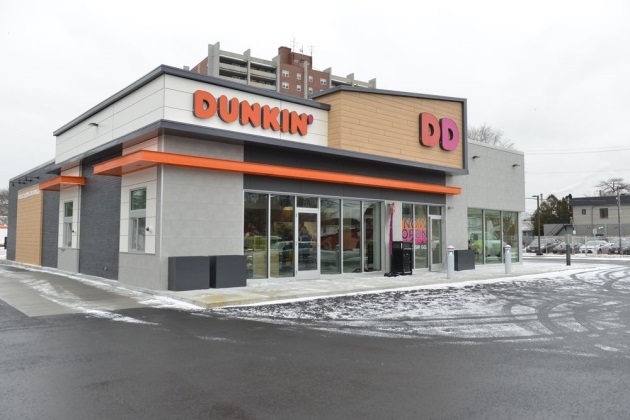 The first of the more modern buildings for the newly branded Dunkin, opened this year in Quincy, a mile away from the original donut store. Law enforcement professionals, donut professionals, city officials and community members enjoyed coffee and the long-held donut tradition. 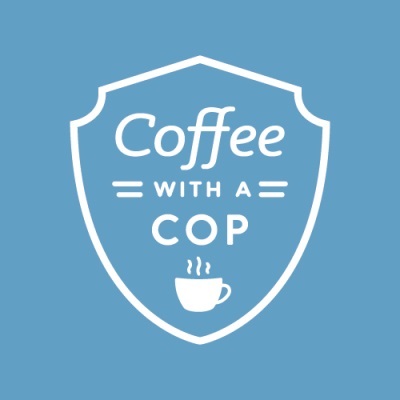 The goal of Coffee with a Cop Day is to have informal conversations about what matters to those members of the community with the cup of coffee as a common bond. The venue is across from the National Park Service’s Adams Presidential Visitor Center. In close proximity to the coffee event are the burial crypts and family church of the Adams family. Some national travelers and out-of-town visitors on this day were treated to coffee and conversation as they waited for their Adams historical home tours. For Sgt. Karyn Barkas, the event afforded a chance to advocate for youth safety. Tucked behind one of the high-top tables around which community members discussed local highs and lows was a box containing dozens of bicycle helmets. These were fitted and distributed to local youth providing an opportunity to provide road safety education to parents and children. The helmets had been donated by the Boston law firm Breakstone, White, and Gluck as part of its Project KidSafe Campaign. Communicating with or without coffee in hand is one of Sgt. Barkas’ talents. She was recognized by Nextdoor as one of 35 law enforcement specialists nationwide as a 2018 Neighborhood champion. Online social network Nextdoor is used by more than 1,500 law enforcement agencies and over 175,000 neighborhoods to connect and engage the community. Traditions help build communities. The city known as home to two founding fathers has many traditions. Among them are those that help bridge communication between the police department and the citizens they protect. Coffee and Cops is a community tradition that is well worth repeating every year.